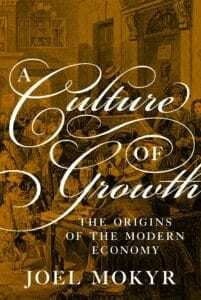 “A Culture of Growth” is an insightful quest into the economic history of the last five centuries. Mokyr’s historical laboratory is early modern Europe, when a small mass of highly skilled artisans, entrepreneurs, financiers and merchants laid the roots of what was to become the Industrial Revolution. While institutions and technology are some of the most widely accepted ingredients of economic progress in modern economics, Mokyr’s focus on “culture” allows his readers to zoom-out and contemplate a much longer time perspective. Firstly, culture is a slow-moving institution when looked at through the lens of economic history. Culture helps certain institutions emerge, but does not guarantee the outcomes. While culture determines the quality of institutions, causality is not a one-way street. Cultural change can be the result of incentives provided by the institutional environment itself, as seen in its ruling elites, their politics and rivalry, etc. Secondly, culture affects technology, and the most direct link runs through religion. If manipulating and controlling nature invoke a sense of fear, then technological creativity will be restricted. Mokyr takes a strong view on cultural change as one of the main factors explaining why the Industrial Revolution happened in Europe, but not in China. In the politically fragmented Europe of the sixteenth and seventeenth centuries, a great number of thinkers could move more or less freely across countries to spread ideas and their curiosity, sometimes in defiance of the ruling elites. Despite being at a similar stage of technological evolution, economic development in China remained under the influence of the ruling elite. The prevalence of Chinese conservatism was not able to generate the same kind of tradition-shattering innovation that Europe experienced after the sixteenth century. One can agree or disagree with these statements, but Mokyr provides such a fascinating story and arguments that readers might find him hard to ignore.